Real Madrid are through to the Champions League semi-finals, after beating Bayern Munich 4-2 in extra time, tonight at the Bernabéu. Cristiano Ronaldo signed another memorable hat-trick, lifting his team up when they needed him the most. 5 goals in 2 games against Bayern Munich. Not bad, right? It was an eventful game tonight at the Santiago Bernabéu. 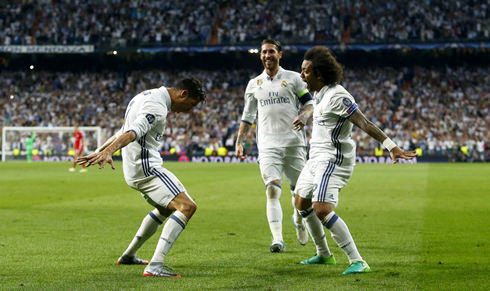 Real Madrid left the pitch victorious just like they had done last week in Germany, beating their rivals Bayern Munich 4-2 in extra time. A 6-3 score on aggregate allows Zidane's men to move forward to the competition's semi-finals and the Frenchman will certainly have much to thank Cristiano Ronaldo for it, who scored 5 of his team's 6 goals in this 2-leg tie. There were plenty of controversial decisions throughout the game, with the referee not always making the right calls and penalizing the visitors in a few plays that turned out to be determinant. Nevertheless, the Merengues deserve all the credit for the way they came back from behind in these 2 games and their perseverance got rewarded with a ticket to the semi-finals. You'd certainly be forgiven if you're still shaking from that match. It was a game that had everything including, unfortunately, some questionable refereeing decisions that may have spoiled the match for some neutrals. Still, in the end, Real Madrid won the match 4-2 on the day and 6-3 on aggregate, in what was a fire cooker of a match at the Bernabéu. After the 2-1 victory away at the Allianz Arena last week, Madrid were hoping to secure passage to the semis, but with Robert Lewandowski and Mats Hummels back in the lineup for the Bavarian side, it seemed clear that this would be a tougher test. And it was! The game started off well for both sides and quickly developed into an end to end frenzy. Madrid had some nice passages of play in the first half, creating numerous chances that truly tested Manuel Neuer in goal for Bayern. Neuer was excellent again and despite allowing six goals over the two legs, he was probably Bayern's best player. Bayern had some good chances too, most notably one that was blocked by Marcelo in the six-yard box. Just one example of one of many fascinating plays that the Brazilian had all night. In the second half things would reach a fever pitch. Casemiro fouled Robben in the box giving Lewandowski the chance to put Bayern 1-0 up on the night. The Polish striker made no mistake. Casemiro may have been lucky to not receive a second yellow as well, a fate not afforded to Arturo Vidal later on, as he was sent off for a somewhat questionable tackle on Marco Asensio. 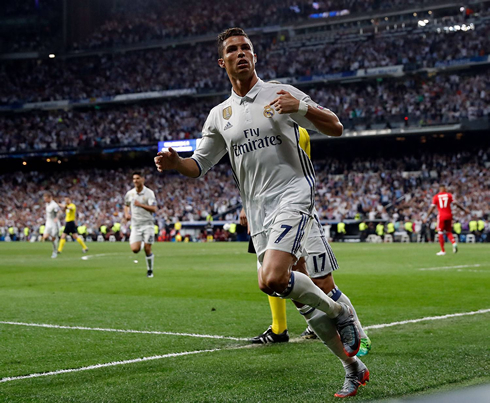 With Bayern down to 10 men again, Madrid looked to capitalize and it was none other than Cristiano Ronaldo with a header to even the score at 1-1 in the 76th minute. Madrid were going through. But the euphoria would be short-lived, as a mixup at the back led to an own goal from Sergio Ramos, who mistakenly hit the ball into his own net. Now at 2-1, the match was heading to extra time. Two exhausted teams went out onto the pitch hoping to secure victory. Down to 10 men, Bayern looked far more likely to concede and Madrid took 15 minutes to break them down. The goal came courtesy of none other than Cristiano Ronaldo, who chested the ball down and fired past Manuel Neuer. However, upon further review, the goal was actually offside which was a shame in the end. Still, Madrid were back on top. And then it became a bit of a massacer. Marcelo broke free dribbling past the Bayern defense before squaring to Ronaldo for his hattrick and later on Asensio would grab a goal with a great finish on a counter. Bayern were totally defeated at this point and Madrid saw out the rest of the match to win 6-3 on aggregate. The hattrick from Ronaldo took him to 100 Champions League goals. A record now set and Real Madrid progress through to the semi finals for the 7th consecutive year. Cristiano Ronaldo next game is El Clasico, a La Liga fixture, on April 23 of 2017 against Barcelona. You can watch Juventus live stream, Real Madrid vs Barcelona, Barcelona vs Juventus, Manchester United vs Anderlecht, Besiktas vs Lyon, and AS Monaco vs Borussia Dortmund, all matches provided from our soccer live game pages.